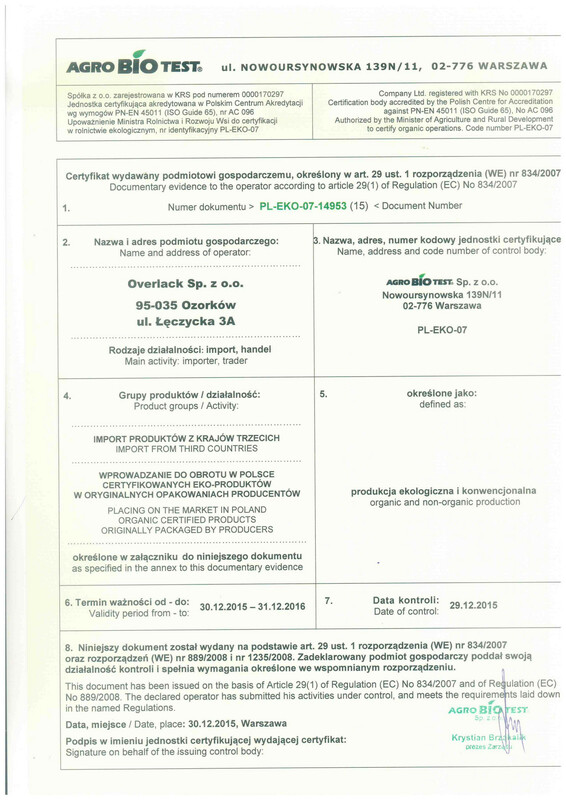 OQEMA Polska fulfils all requirements concerning the import and distribution of organic raw materials in Poland. Organic products should meet basic principles concerning the production and cultivation of organic plants by the elimination of chemical fertilisers and plant protection agents, the application of organic agents, the location of crops in an appropriate distance from roads, communication routes and production plants, with at least two-year transitional period before the commencement of organic crop production. Similar principles govern the organic livestock production: maintaining the feeding of livestock with organic-farming crop products, ensuring ongoing access to natural pastures and areas and the prohibition on the use of all kinds of growth promoters and hormones, genetically modified organisms, preservatives, synthetic colouring agents and improvers. Farming conditions, proper treatment of animals and humane slaughter are also important aspects to consider. The OQEMA warehouse is adjusted to the storage of organic products – it is a specially dedicated warehouse hall with appropriate conditions.